Two and a half months ago I posted about moving across the state to start a new job. In my post, I mentioned that my next update might be a little late. I didn’t quite expect that it would come 2 1/2 months late. My tardiness is an unfortunate combination of not having internet at my house for 6 weeks and having a job that demanded more of my time than I anticipated. 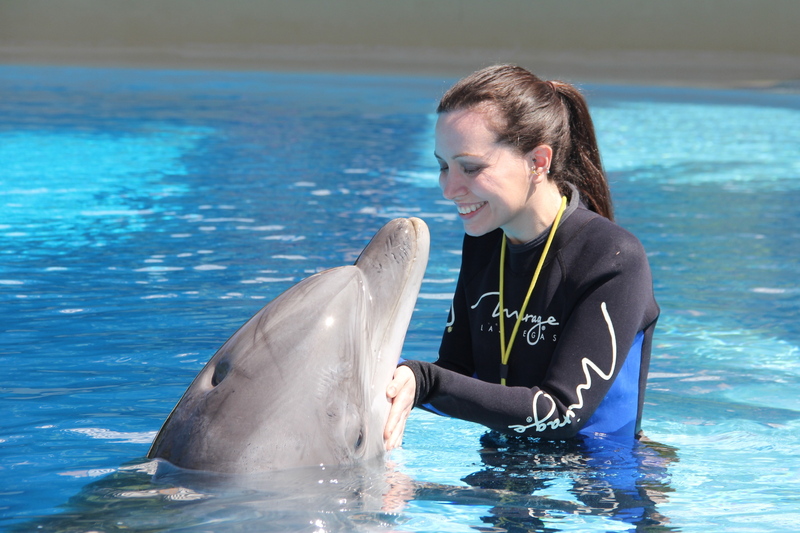 I am happy to report, however, that I absolutely have my dream job. Now that things have settled down a bit, I will attempt to resume posting weekly about my adventures and new experiences. I am particularly excited because the first day of autumn is just around the corner. I’ve been looking forward to corn mazes, apple picking, haunted houses, and all the other things that are perfect for this time of year. To ease back into things I thought I would start with what I intended to be for Week 26: Eggs Benedict & A Bloody Mary. Eggs Benedict is one of my all-time favorite indulgences. It’s rich, delicious, and the perfect Sunday brunch meal. Eggs Benedict is not named after Benedict Arnold (come on, you know you wondered too), instead it is supposedly named after a stock broker who was looking for a hangover cure in 1894. The basic Eggs Benedict consists of an english muffin, ham or bacon, a poached egg, and hollandaise sauce. 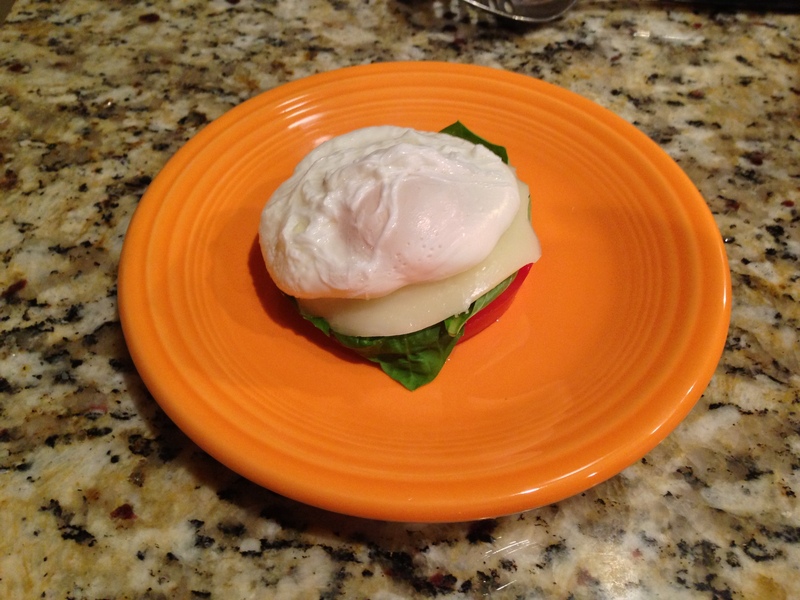 There are many varieties, but I decided to go for Eggs Benedict Caprese. Instead of the english muffin and meat, I went for fresh tomatoes, basil, and mozzarella. I started with the hollandaise sauce, which is essentially eggs, lemon juice, and a ton of butter. Seriously, it used a lot of butter. I hope you future cardiologists are studying hard out there. I may need you one day. I refuse to substitute the fake stuff for the real thing. The recipe I used called for a blender, but I decided to mix by hand. Partly because I actually enjoy doing things the hard way, and partly because I didn’t feel like washing a blender. This probably took a lot longer than necessary. I whisked and whisked for several minutes until the sauce finally began to thicken. Then it was time to poach the egg. I thought this would be the most difficult part, but it turned out to be surprisingly easy. 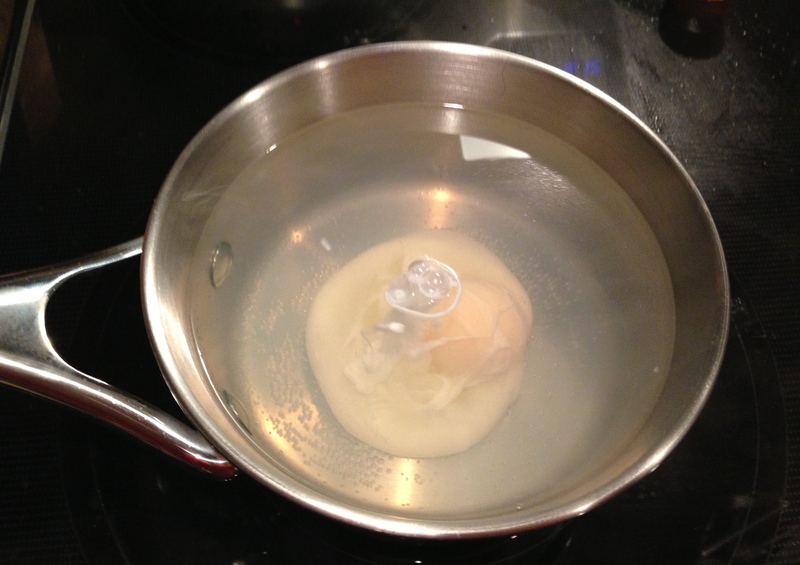 I read about several different methods of egg poaching, and settled on the whirlpool method. After the water comes to a simmer, you swirl the water and drop the egg into the center. The spinning water helps keep the yolk together. Above, is what the egg looked like right after I dropped it in. After the egg began to turn white, I slowly swirled the water so it would not stick to the pot. I was really scared I was going to break to yolk when it came time to scoop it out, but it was a lot sturdier than it looked. I was very very pleased with how the poached egg turned out. I can’t believe I managed to do it right on my first try. Apparently, I missed the part of the instructions for the hollandaise that said I was supposed to keep it warm to prevent it from thickening. In the time it took me to poach the egg, it went from a beautiful, smooth, creamy sauce, to . . . well . . . something slightly thicker. I considered recreating this recipe to have something a little prettier for you all, but I decided that that wouldn’t be very authentic. In the end, it still tasted amazing and I can’t wait to use what I learned to do things better the next time. Let me start by saying that this is the first thing on my List that I never want to repeat again. Bloody Marys are disgusting. How do people drink these things? The cocktail generally consists of vodka, tomato juice, Worcestershire sauce, Tabasco sauce, horseradish, celery, black pepper, cayenne pepper, lemon juice, and other vile things I can only begin to imagine. Mine had a cucumber, lemon wedge, and olive floating around it it. The morning after a friend’s wedding a group of us went out for brunch. We were at my favorite Knoxville restaurant, so I thought it might be time to try out a Bloody Mary. When I told our waiter that I was considering having my first one, he responded, “You’ve never had a Bloody Mary!? Did you just turn 12?” I said that I wasn’t sure I would like it because I wasn’t a fan of tomato juice, but I was assured that vodka made everything taste better. They lied. Vodka did not make it taste better. Nothing could make that horrible combination of ingredients taste better. I took one sip and that was enough for me. I tried to entice someone else to drink it so it would not go to waste, but none of the 6 people at the table wanted anything to do with it. I felt sad for my poor, neglected, unwanted Bloody Mary . . . but not enough to drink it. Previous Previous post: Vegas baby, Vegas! The blog is back! But oh, bloody marys are so good! However I’ve noticed that when they’re bad they’re awful, when they’re mediocre they’re still pretty awful, but when they’re good, they’re amazing. And I have had a lot of bad ones, it seems a skill that many bartenders do not possess. I’m going to have to take your word for it, Clay. If there is a spot in Nashville that knows how to do it right, perhaps I’ll let you buy me one. I am so excited to try my hand at this! best brunch ideas. It was so much easier than I thought it would be. It looks so intimidating when I order it in restaurants. I hope, hope, hope that you let your server have it for that one. Or, better yet, didn’t let them have their tip. That sort of rudeness should not be tolerated; especially in the South. He was actually an awesome waiter and completely hilarious. He was just joking around with me. So glad you’re back. I’ve really missed reading about your adventures. Eggs Benedict are my favs! I found that freshly laid eggs are the easiest – you don’t have to worry about keeping the egg white together by swirling water – add a bit of vinegar to your barely simmering water, and find a farmers market that sells fresh, fresh eggs – most of the eggs in the supermarkets are at least 2 weeks old. There is a huge difference in taste and texture. Funny thing is that I could never stand tomato juice, hated it from my youth, but in my days as a country club bartender my bloody marys were legendary. Members used to drag me back from behind the bar to meet their spouses, who were ecstatic about my concoction. Maybe it’s because I hated it so much I could be obejective about making one. Bloody Mary is best with the glass rim coated with celery salt and a substantial stalk of celery to enjoy along with a couple of olives. Intelligence is knowing tomato is a fruit; wisdom is knowing not to put it in a fruit salad. the whole fat = heart problems thing is pretty ingrained culturally i know, but when separated from carbs or non-real fats, benign or just healthy. do not fear your butter 🙂 inflammation and insulin? yeah fear that. I like a good Bloody Mary, but if you can’t stand tomato juice I can’t imagine that you’d ever like a Bloody Mary, no matter how well it’s made. Bloody Marys and Eggs Benedict, +100 on the Cumberbatch scale. Breakfast for dinner is always the answer. Hollandaise should never, ever be made with a blender. Since yours took so long to come together my guess is that you added most, if not all of the butter at once. This is a major mistake, and if so, you are lucky it came together at all. 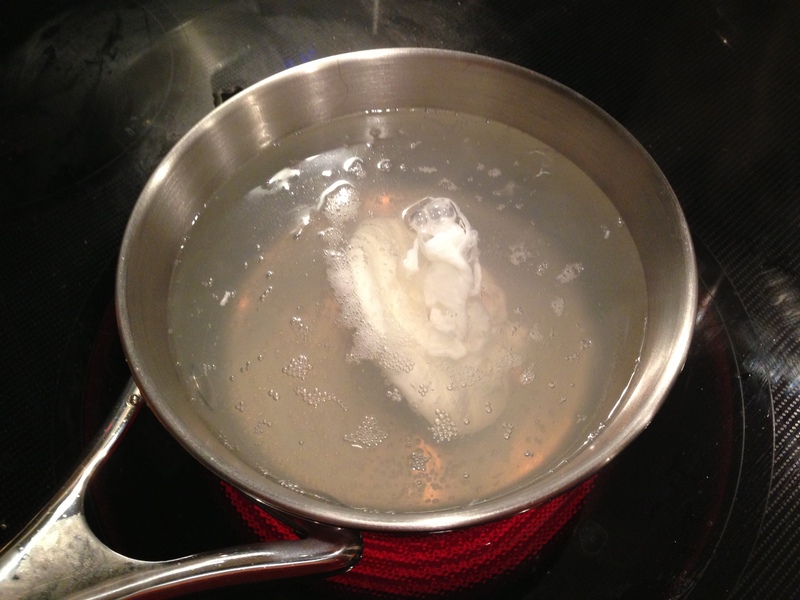 Start with the pre-melted clarified butter, and egg yolks in a steel mixing bowl over simmering (not boiling) water. 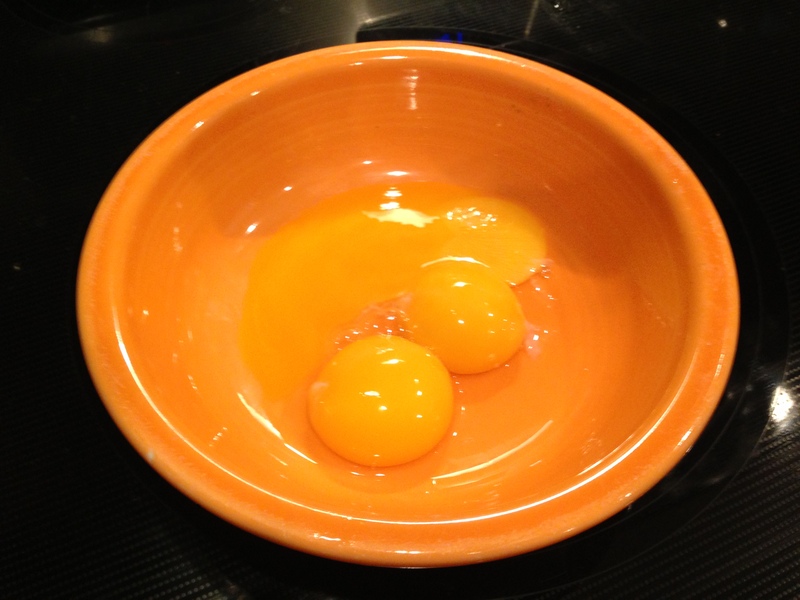 Whisk the yolks until they just change color then begin adding the butter in small amounts. It should emulsify immediately. 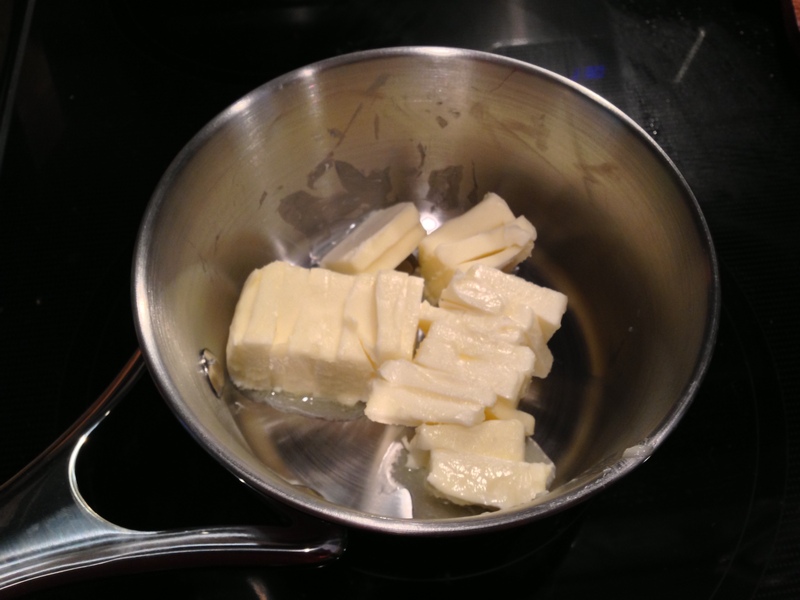 Then it is just a matter of adding butter to achieve the proper consistency. When warm it should be no thicker than heavy cream – that way it stays fluid even when cooled. Lastly add the lemon juice and a pinch or two of cayenne. Bloody Marys are what they are. How anyone could argue that vodka could change the taste anything escapes me. If you don’t like straight tomato juice but aren’t willing to give up try Beefamato. Or try gin for a Bloody Caesar. But really the best eye opener to go with Eggs Anything is a Sazerac. 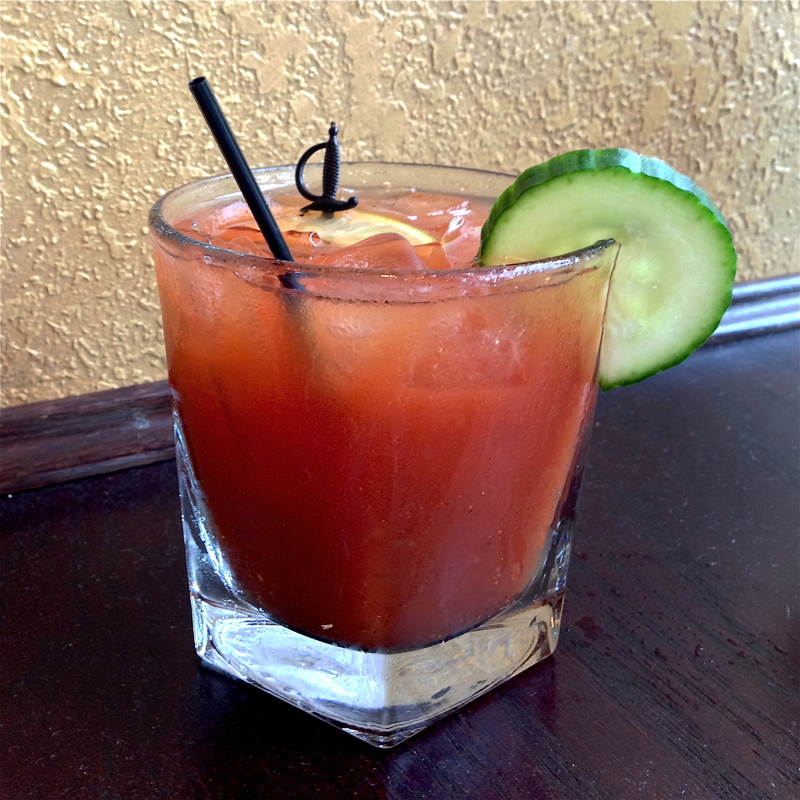 My secret to a good Bloody Mary – use V8 Juice instead of plain tomato juice. My father used Mr. & Mrs. T Bloody Mary Mix, to which one merely adds the Vodka. But that takes all the fun out of it. And costs more than the Vodka by volume. Hollandaise remains a mystery to me – I can order Eggs Benedict but I’ve never been able to make my own. So I just have another Bloody Mary and eat the parts separately. All you need to know about eggs benedict is; stove top hollandaise, crisped Canadian bacon, barely poached eggs (water with a drop of vinegar) and toasted sourdough English muffin. 1 cup crushed ice, 1/2 cup light cream or half and half 3 oz. gin (6 T) 2 T. simple syrup , 4 t. lemon juice 4 drops orange flower water 1 cup carbonated water, chilled. Oh, wait!, This recipe left out the 4 egg whites, frothed not stiffened (no viagra joke here) folded in. BTW, i got here thanks to Instapundit. Eggs Benedict is awfully good with Canadian bacon and a few thin slices of avocado along with the poached egg and Hollandaise sauce. Also, I like my Bloody Mary made with V8 instead of plain tomato juice. Try it, you’ll like it ! Bravo! I’m SO trying the Eggs Benedict Caprese. Might have to sneak a thin slice of prosciutto or salami in there just to overindulge. Sail right by the V8 and use an ice cold can of Snap-E-Tom, and don’t go overboard on the vodka. Garnish with green olives and a lime slice. Best served at early morning tailgate parties. 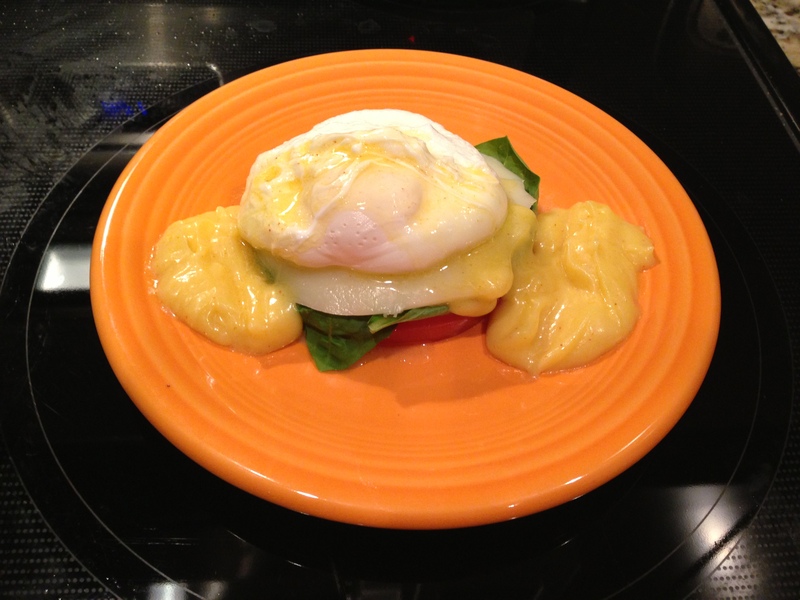 I like your blog but yikes that Hollandaise sauce is a mess. Keep trying – follow thomasd66’s advice. Do not fear butter, or the eggs, they are good for you (and the clarified butter is even better). Really they are. 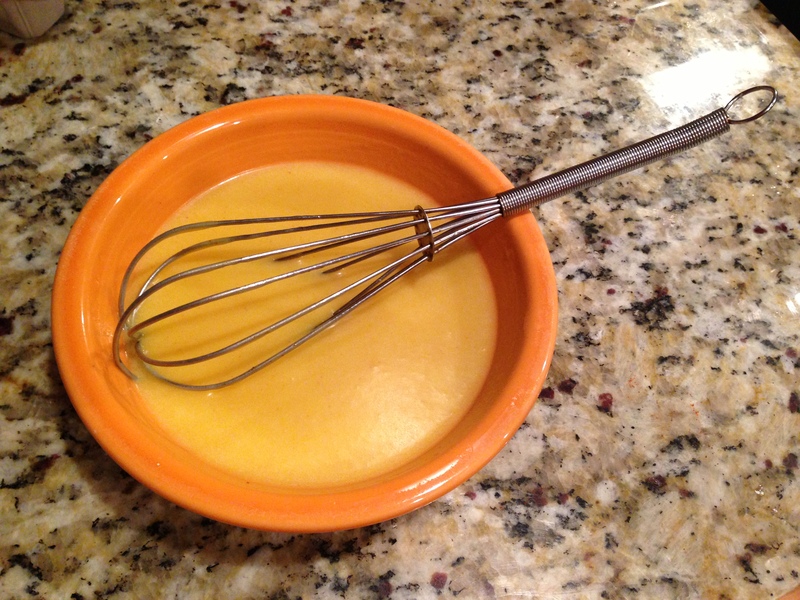 Get a double boiler for your Hollandaise sauce and follow thomas66’s advice. It’s not a blood mary unless it comes with a snit. Make it with Clamato juice and all will be well. I believe this is what is called a Bloody Caesar, although one or the other respondents has a Bloody Caesar being made with tomato juice and gin instead of vodka. I think this is wrong. But even had found that Bloody Mary palatable, after tasting a Bloody Caesar you’d never want a Bloody Mary again. Pssst – you’re correct about Bloodies, btw – plus, who wants to drink something which has vegetables sticking out of it, threatening to poke your eyes? Up here in Wisconsin, Bloodies have so much crap in them, it looks like you’re drinking a salad. I totally agree, I will not be repeating that one!